U.S. Joint Forces Command Military Support to Economic Normalization Draft Handbook. | The Daily Cheese. U.S. Joint Forces Command Military Support to Economic Normalization Draft Handbook. The Armed forces are preparing for the collapse are you? QE3 has been used its the final desperate action of those deemed too big to fail.For the rest of us its the final sign that the Euro and Dollar are done. The following is a draft version of the U.S. Joint Forces Command handbook on “military support on economic normalization.” Due to the fact that it is a draft version, the document contains a number of comments from an unnamed reviewer suggesting changes to be made in the final draft. 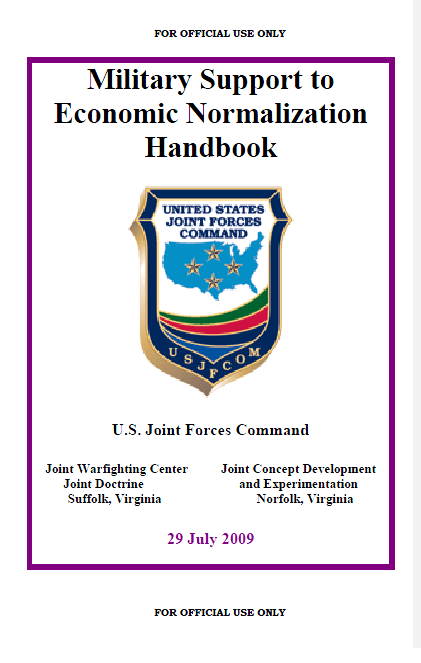 The Military Support to Economic Normalization Handbook provides established and evolving tactics, techniques, and procedures used by military personnel involved in day-to-day support to economic normalization. This handbook serves as a bridge between current operational-level doctrine and tactical-level employment at the joint force level. It is intended to inform doctrine writers, educators, and trainers about military support to economic normalization. It supplements, not replaces, existing joint or Service doctrine. The handbook is designed for use by personnel assigned to (or participating in) a joint operation and provides guidance at the operational level on the range of functions required to secure economic stability during or in the immediate post-conflict. Where doctrine is absent, it also presents definitions and constructs from the interagency and international community that have been harmonized with joint doctrine and discusses those ―best practices‖ that have proven of value during on-going military operations, exercises, and experimentation. a. Economic normalization is enabling a host nation establish a sense of stability by resuming the routine commercial activities of operating businesses, employment, and markets. It does not equate to returning to the status quo, or conditions that existed prior to the conflict, particularly if these contributed to the conflict. b. Whenever military forces conduct stability operations, it could involve combat operations and typically initially focuses on securing and safeguarding the populace, reestablishing civil law and order, restoring public services and key infrastructure. Many of the stability operations tasks are best performed by indigenous, foreign or U.S. civilian subject matter experts (SMEs). However, because of the hostile environment, military dominating presence, ability to control forces, logistics capabilities, or the lack such capacities by other agencies, U.S. military forces are directed by Department of Defense (DOD) policy to be prepared to lead the activities necessary to accomplish these tasks. Once legitimate civil authority is prepared to conduct such tasks, US military forces will transition to support the activities. a. Providing employment is both an immediate peacekeeping and post-conflict objective, and a means of establishing the foundation for future economic growth and political stability. The primary emphasis in the immediate post-conflict period is to provide employment quickly, even if those jobs are temporary and not sustainable. If joint forces can pay young men to pick up shovels, it is a better alternative to being paid by the enemy to pick up guns. Even though the military focus will be on quickly implementing short-term efforts, it is essential that the military and civilian agencies have a common understanding of the problems and risks, and work to align short-term efforts to support civilian agency longer term economic and political development strategies. Coordinated planning should consider political and social dynamics, host nation institutions, private sector development, and requirements for a viable peace. The United Nations High Commissioner for Refugees, who has championed quick acting programs, states ―Unless Quick Impact Programs form part of an integrated strategy for reintegration, rehabilitation and reconstruction, and designed with community participation their impact is likely to be insufficient, isolated and short-lived. Ideally, joint force projects should provide immediate and visible impact on the local population, support the legitimacy of the host nation government, create linkages to other efforts, and stimulate follow-on activity. h. Stable Currency, Inflation and Minimizing the Impact of Military Spending on the Local Economy. A stable and growing economy requires low inflation and keeping people’s purchasing power stable. Conflict, large budgetary deficits, lack of public confidence in the government, and other factors may add to inflation, causing residents to flee the national currency and convert their funds to dollars, Euros, or other currencies. The mere presence of the Joint Force will also directly and immediately affect the local economy. Without careful planning this joint force increase on demand may increase inflationary pressure. To maximize the positive effect on the economy, forces should purchase goods and services on the local economy, provided that purchases do not create local shortages that hurt the local population. If necessary, facilitate supplement of local population supply through foreign assistance. To minimize the effect on inflation, joint forces should make all payments for goods and services in the local currency, pay wages for local services at an appropriate wage-rate, and ensure prices paid for local goods are not inflated. When present, the United Nations can research local conditions and recommend an appropriate wage rate for use by all donors. Although more convenient to use dollars, using the local currency helps put useable cash in the hands of the populace, stimulates the economy, and demonstrates confidence in the country’s government. It is a concrete action reinforcing the strategic message that joint forces are engaged with the populace and avoids aggravating any local tensions between the ―haves‖—persons with access to U.S. dollar-denominated payments—and ―have-nots.‖ Finally, joint forces should use and encourage electronic payment systems going directly to the individual (to the extent feasible), to discourage embezzlement and corruption.